Well, hello there. Look, I didn’t mysteriously disappear for days this time! That’s an achievement, given how I’ve done the disappearing act quite a few times in the last couple of months. 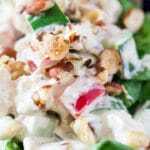 And today I’ve got such a delicious and versatile recipe for you – Creamy Chicken Hazelnut Salad. I actually made this Creamy Chicken Hazelnut Salad way back in May and it’s been sitting in my draft folder for ages. Partly due to my secret and also partly due to procrastination. If you know me in person, you know I’m a professional procrastinator. In fact, if professional procrastinator was a career option, I would probably be ruling the world or something. Except, I’d also procrastinate my ruling duties (unless they involved eating and watching series), because that’s what procrastinators are best at. Haha. While I’ve certainly become a bit productive in the last few days, that certainly doesn’t mean I’m willing to spend too much time in the kitchen, especially given how hot it is these days. Basically the world is melting (dramatic much) and while I would love to live on ice cream and orange juice that’s not very sustainable in the long run. 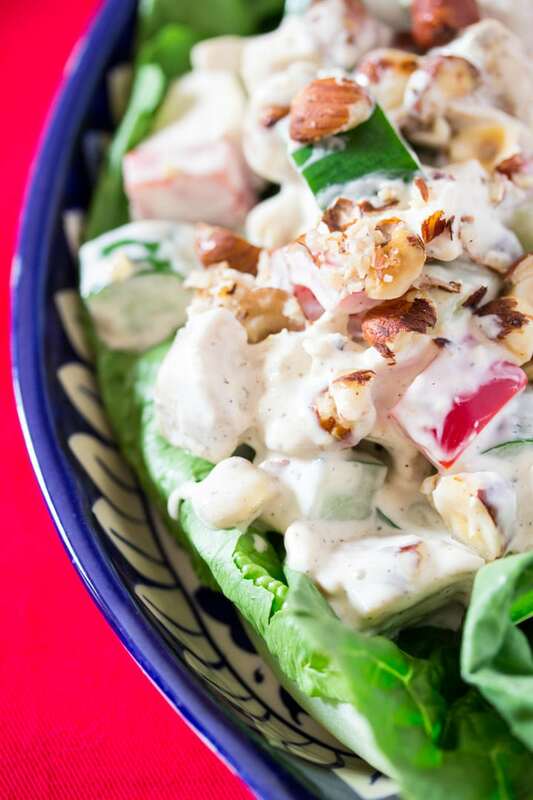 So this Creamy Chicken Hazelnut Salad is the perfect solution. It might not be the healthiest salad in the world, but it certainly is one of the easiest and most delicious! 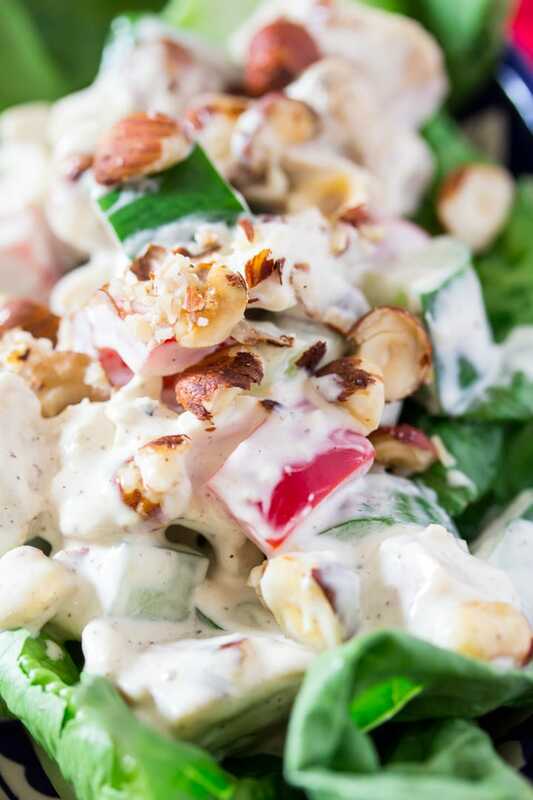 And I’m sure you’ll agree with me, once you make this super duper creamy chicken salad. 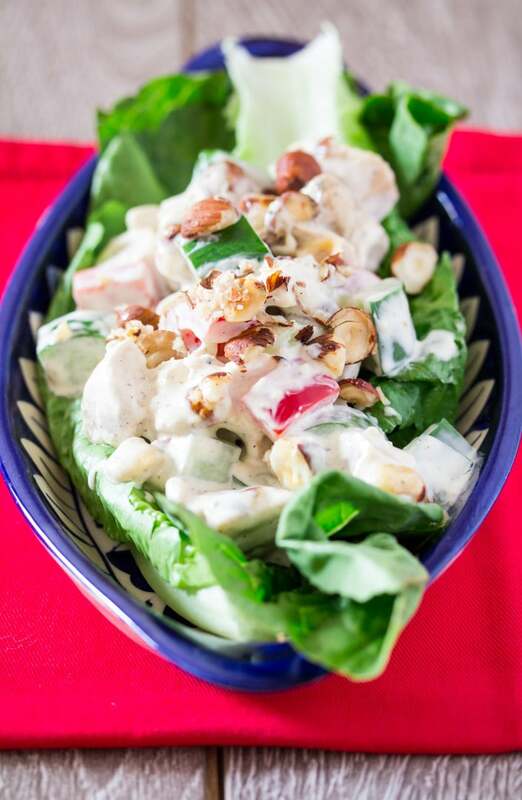 Pile up this Creamy Chicken Hazelnut Salad on top of thick pillowy bread, or wrap it up in a tortilla, it’s delicious either way. The salad is super easy, so I’m not going to go much into details on how its made because that’s what the recipe card is for. But I have only one instruction that I want you to follow, PLEASE do add hazelnuts because the extra crunch and nuttiness is mind blowingly delicious! If you don’t like hazelnuts, walnuts would be a great substitution too! 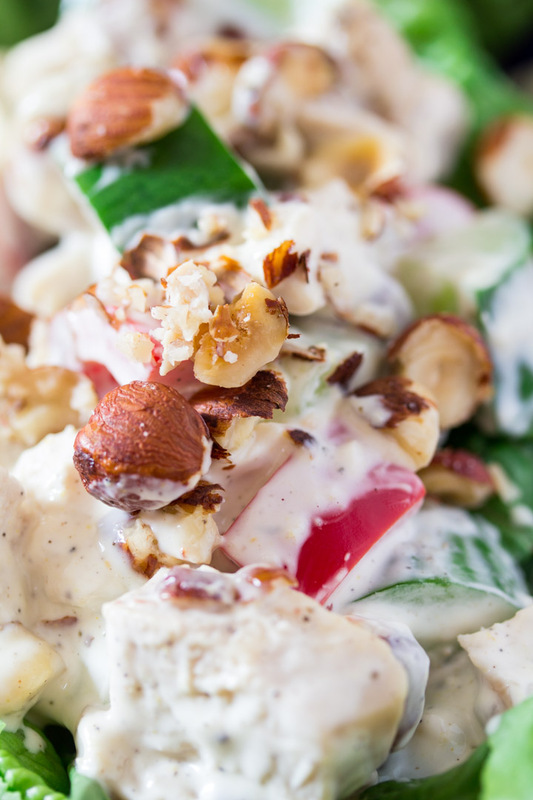 This Creamy Chicken Hazelnut Salad is a keeper. Easy, excellent creamy chicken salad with crunchy hazelnuts, juicy cherry tomatoes and fresh cucumbers. In a mixing bowl, add all the salad ingredients and gently toss. In a small bowl mix together the dressing ingredients until fully combined. Pour the dressing over the chicken salad, and toss until the salad is evenly coated. Chill in the fridge until ready to serve. This salad is very versatile and can be eaten on its own, or used as a filling in sandwiches and wraps. What a delicious looking chicken salad! It’s perfect for this heat, I’m glad you procrastinated! I love the variety of textures-this looks so, so good!